HISTORY repeated itself on Saturday when Dumbarton lost 3-0 away to a club involved in the SPFL Championship play-off battle — this time Alloa Athletic. A meagre 535 crowd endured hail, rain and sometime bright sunshine at Recreation Park and saw a repeat performance from Sons to their 3-0 defeat at Cowdenbeath seven days earlier. Already safe Sons were woefully off the pace and allowed the home side — driven on by new manager Danny Lennon — to end their run of 15 matches without a win over Dumbarton. It was poor fare for the ever-faithful Sons travelling support who expected better. A brilliant Iain Flannigan free-kick over the wall into the near corner of the net left keeper Danny Rogers flailing, and it happened again a few minutes later with a superb run and finish by diminutive no.7 Kevin Cawley. 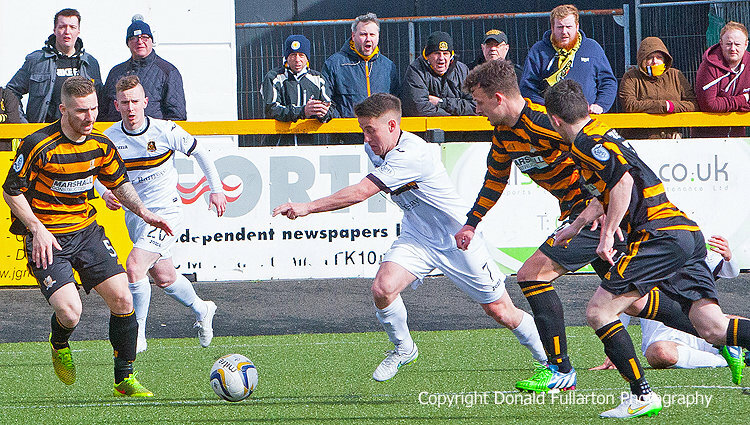 Half-time arrived with Alloa 2-0 up, and the visitors posed little more of a challenge in the second period. The only goal came when a breakdown in communication between keeper Rogers and Stuart Findlay allowed Greig Spence to slip in and dink the ball over the keeper before nodding in from less than a yard. The picture shows Mark Gilhaney breaking forward.